Every day this week I have had to be downtown and have taken the bus there. The walk to the bus stop from my house is half a block. But to come home the bus stop is a walk of 9 blocks. There is a closer stop but I have a wait of about 30 minutes and it is hot and no shade there so I go to the transfer station where there is a place to sit in air conditioning. Well, because I like walking and it is only about 10 minutes and the streets are shady, and I don’t like standing around waiting, so I walk. Even with the 98* temperatures the walks have been pleasant. Downtown of this city is beginning to come alive again after years of being pretty much dead. Stores are moving back to Main Street and apartments have been built and are occupied, there are restaurants and cafes. 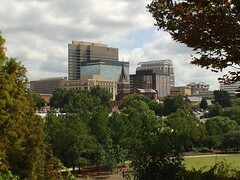 The art museum, library, and State House are beautiful as are many of the office buildings and courthouses. There are universities and colleges and churches with lovely buildings and grounds. After years of nearly deserted streets it is wonderful to see people out and about. Most with smiling faces and a nod or hello when we pass. Today I am thankful that even in difficult times the people of this city are working to make it a better place to work and live.